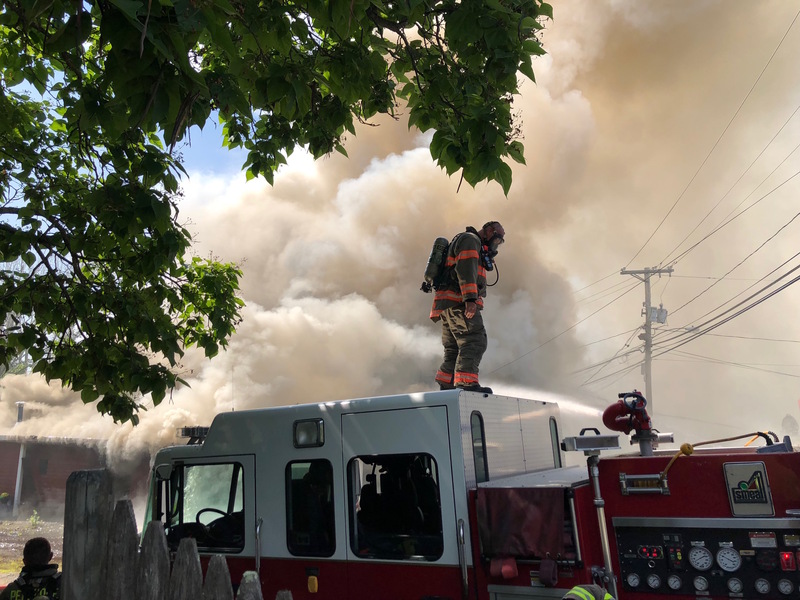 HANSON – A three-alarm fire on Thursday, July 5 has been deemed suspicious by state and local public safety officials. 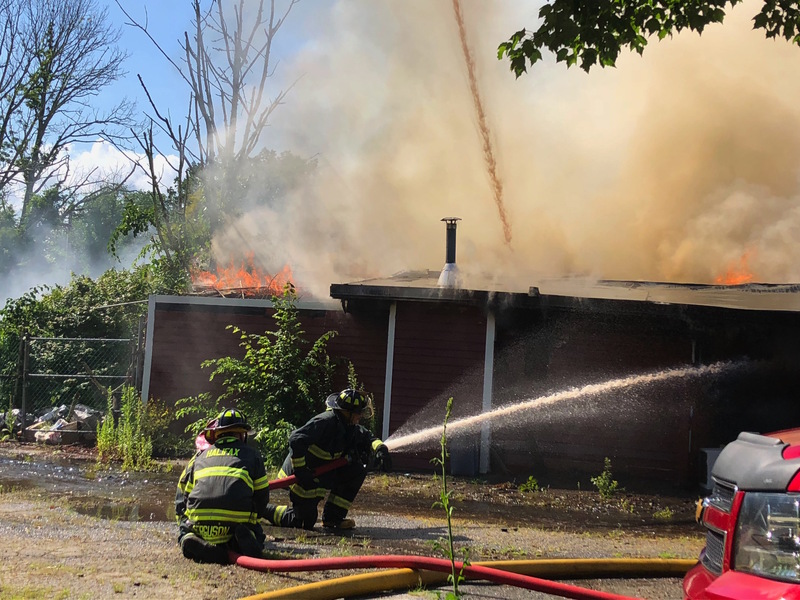 Firefighters from several area communities assisted Hanson Fire Department in battling a three-alarm fire in a vacant building. No injuries were reported, but two firefighters were transported to the hospital for treatment of heat-related illness. The cause of the fire has not been determined and the incident is still under investigation by Hanson Police and Fire and the State Fire Marshall’s office. Anyone who has information about the fire is asked to call Hanson Police at 781-293-4625 or the state Arson Hotline at 1-800-682-9229. Hanson fire personnel responded to calls reporting the fire at 16 Liberty St. – the former JJ’s Pub – at about 3 p.m. Flames were visible on their arrival and crews immediately began to fight the fire as second and third alarms were struck calling companies from numerous area towns to assist. Hanson Fire Chief Jerome Thompson Jr., reported that the fire was extinguished by 6 p.m., but that fire crews were still dousing hot spots. 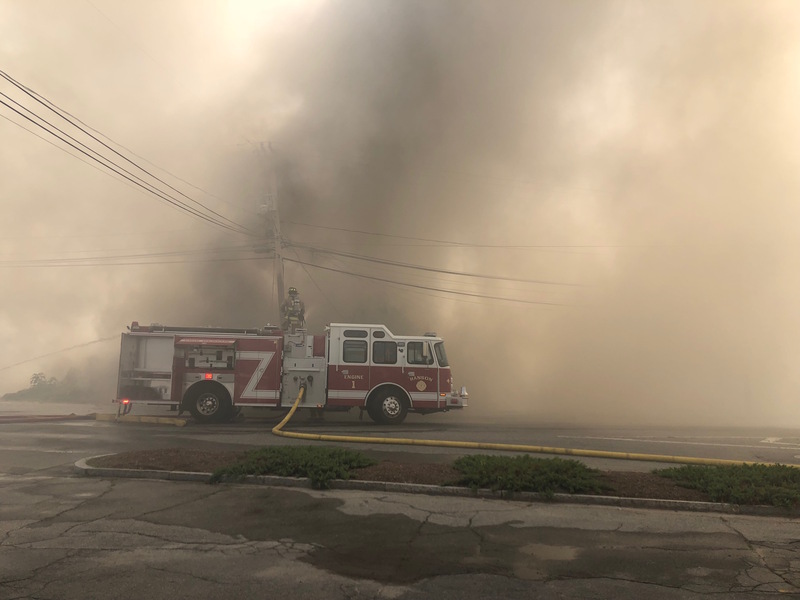 Route 58, at the intersection of Liberty and East Washington streets remained closed to traffic while the scene remained active and residents were asked to avoid the area. Thompson and Police Chief Michael Miksch thanked the residents for their patience. The cause and origin of the blaze are not known and it is under investigation by the State Fire Marshall’s office. Hanson Fire also Tweeted their thanks to the departments that assisted today at the fire. “We also would like to thank our other Town departments that assisted and members of the public who dropped off water and Gatorade,” the Twitter post stated. HANSON — The Board of Selectmen has approved the placement of a local-control retail marijuana bylaw, banning the sale of cannabis, before October’s special Town Meeting as well as a referendum ballot. Discussing the issue only among themselves without accepting questions or comments from the public, the board agreed 5-0 that the state’s Chapter 94G provisions for the two-step process would best permit residents to have a say on the issue. Selectmen also declined to share their own personal opinions on the issue as irrelevant. Selectman Laura FitzGerald-Kemmett, who asked for the issue to be placed on the board’s agenda, agreed with Mitchell. She said she did not anticipate, nor endorse “continually” bringing the issue back before the board. “Move forward,” Selectman Wes Blauss said in support of the article. “I believe the will of the people will really be voiced,” agreed Selectman Matt Dyer. “It’s up to the people,” Selectman Jim Hickey said. Selectmen plan to hold an informational forum on the issue before the special Town Meeting to permit residents to ask questions and/or comment on the issue. The next year Town Meeting rejected a moratorium measure sought by the Planning Board, based on an East Bridgewater measure designed to provide towns more time to obtain more information before further action was taken. In July 2017, Gov. Charlie Baker developed a process for towns that voted yes on the 2016 ballot to opt out of permitting retail shops within their borders. A local-control bylaw would have to go before Town Meeting, and if approved there, to a referendum. “The two votes that we’ve had are totally different than we’re discussing tonight,” Mitchell said. In other business, the board approved a request by the Education Committee to place information, as well as a request for donations, on the tax bill in an effort to spur donations. “There’s a misconception bout what the Hanson Education Fund is and we’re hoping to alleviate some of that and have people understand what it is,” said Chairman Gary Banuk. The fund has been on the tax bill as a donation option since 1993. Response has not been good of late, with last year averaging about $150 per quarter in total donations. “That’s not really a lot to help the students of Hanson,” Banuk said, noting that funds had been donated to purchase Chromebooks for Hanson schools last year. It is not limited to primary or secondary school pupils. Residents of Hanson with educational expenses are welcome to apply for funding, including for college or other vocational education costs such as books. Selectmen also discussed their goals for the year, most of which are ongoing projects. But Blauss requested the addition of a plastic bag ban and Dyer asked if polystyrene beverage cups could be added to that list. Town Administrator Michael McCue said that issue, conceivably could go before the October Town Meeting, providing a grace period until the start of next fiscal year before implementation in order to give local businesses time to make accommodation. HANSON — Selectmen welcomed two new members and discussed ways to attract more residents to the ranks of public service at the board’s annual reorganizational meeting on Tuesday, May 22. Selectman Kenny Mitchell was also elected the board’s new chairman, joined by new Vice Chairman Jim Hickey and Matt Dyer as clerk. Dyer, Selectman Wes Blauss, Cemetery Commissioner Jim Flanagan — who had accepted his four-write-in-vote win — Health Board member Arlene Dias and Housing Authority member Benjamin Fletcher were sworn in by Town Clerk Elizabeth Sloan to start the meeting. W-H senior Marc Benjamino was among more than two dozen people receiving one write-in vote for cemetery commissioner, with another nine people attracting two or three votes each. Mitchell offered thanks to former Selectmen Chairman James McGahan and former member Don Howard for their service. Mitchell also noted that Howard, who served on more than a half-dozen committees might be interested in, and would certainly be welcome to, continue serving on some of those. Not all the appointments need to be selectmen. Mitchell asked Blauss and Dyer to look over the committee assignments filled by Howard and McGahan to determine which ones they would be interested in serving. Selectman Laura FitzGerald-Kemmett suggested that social media platforms such as Facebook could be used to outline the skill sets needed and time demands required of boards and commissions. She has been doing some of that outreach on her own already. “We need some fresh faces,” FitzGerald-Kemmett said. FitzGerald-Kemmett also reiterated the need for more transparency in the process for filling appointed committee vacancies, urging they be posted with more regularity to help attract new people with the right skill sets and reassure the public. Selectmen also reviewed their goals for the year, many of which are still in the works — such as reuse of the Maquan School building, new cell towers, Plymouth County Hospital reuse, potential new highway building among them — while goals of hiring a new police lieutenant and a part-time facilities manager have been completed. HANSON — When voters go to the polls in Whitman and Hanson on Saturday, May 19, they will see only one contested race in each town — three candidates vying for two school committee seats in Whitman — incumbent Fred Small, Heidi Hosmer and Christopher Scriven — and four candidates running for two selectmen seats in Hanson. Polls in both towns are open from 9 a.m. to 5 p.m., with all Whitman precincts voting at Town Hall and all Hanson precincts voting in Hanson Middle School. Hanson voters had the chance on Sunday, May 6 to hear the candidates’ position on the issues and to ask questions during an annual forum jointly sponsored by the town’s Democratic and Republican town committees. Town Moderator Sean Kealy, himself a candidate for re-election, moderated the event. “This is an opportunity to get to know who’s on the ballot and where they stand,” Kealy said. Going through the ballot in reverse order, Kealy noted that some candidates were unable to, or opted not to, attend the session. School Committee Chairman Bob Hayes took the opportunity to talk about his candidacy and ask for voter support at the forum, as did constable August P. Silva. He has served on the school committee for 15 years and has been chairman for 11. Both of his children are W-H graduates who bought homes in Hanson. The other uncontested candidate for re-election is Steven W. Lyons. But the bulk of the afternoon was focused on the four selectmen candidates: incumbent Donald H. Howard, Wesley Blauss, Matthew J. Dyer and Joseph R. Weeks III. Howard noted his residence in the home he built in town in 1960 and his 10 years’ service on the Board of Selectmen in his opening statement as well as his concern over the need for expansion of the town’s commercial tax base. Dyer, who grew up in Hanson, is a political newcomer who noted his wish to give back to the community as well as the need to diversify the tax revenue to attract new business in town. Weeks, too, is a Hanson native — who briefly lived in nearby Rockland — strives to give back to the community and stressed the need for business development and long-term sustainable planning, especially in the Main Street corridor. Weeks is now ending his service as a member of the Planning Board. Blauss, retired after a 40-year teaching career and 30-year member of the Recreation Commission, stressed education and environmental concerns in his opening statement, saying he believes strongly in the affect of global climate change on the lives of today’s children and is a proponent of the pay-as-you-throw trash program. He is also a member of the Hanson Historical Society. Howard said Conservation regulations regarding wetland areas along Main Street and a drainage problem from Phillips Street create a particular challenge to development there. “I’d love to see something done down there,” he said. He said the people’s voice should rule what is ultimately done to develop the former Plymouth County Hospital site. “Right now we are a drive-through community and we need to [develop] some sort of destination,” Dyer said. He advocated development of a project like a boardwalk trail along the wetlands to entice visitors to come to town and develop a multi-use project at the old Ocean Spray building as well as bringing high-speed internet and sewage service to town to help business development. For the PCH site, an indoor soccer facility could be a way to meet the growing demand for such a field in the area, Dyer said. Weeks advocates continuation of the complete streets project to make Hanson a more walkable town and, along with tax provisions, can bring more business to town as part of a long-term plan. He agrees with Howard, however, that drainage issues have to be dealt with first. For parts of that stretch of Main Street that is not a draw, he said he is not certain how much town-owned land there is in the area with which the town can work. Dyer, who is a member of Green Hanson, said he has worked on green technology and sustainability, noting that Green Community status is “that next step” for Hanson. Weeks has also been a member of Green Hanson before getting involved in other town committees, said the Planning Board has already taken up the Green Community process. Bluass, noting that so many other communities are working toward plastic grocery bag bans, said he doesn’t know why Hanson hasn’t followed suit. “I think that there are plenty of avenues that we can start talking about [that in],” he said. He said it was worth allowing the public to discuss and vote on it. Blauss said the stipulations for admission to sufficient facts for conviction or outright conviction of a crime as required by the revision, could take too much time. Howard agreed that the public has a right to debate and vote on an issue at Town Meeting, which is why he voted to place it on the warrant. Dyer said he opposed the article. Howard said he was surprised that Hanson voters voted in favor of the 2016 state ballot question. Dyer also said it should be on a town ballot. Weeks said, while there is a referendum option, the moratorium article that the Planning Board drafted last year to provide time to explore that option was voted down at Town Meeting last year. He said he would support a referendum question. Howard said that, to be honest, he didn’t really have much involvement with the issue and didn’t have an answer for why a private vendor arrangement was approved. Weeks agreed, arguing privatizing Camp Kiwanee is not in the best interests of the town. Blauss, said he was involved in the purchase of Kiwanee by the town in 1979 as a community recreational center. The weddings and rentals have been used to subsidize its operation. Library Trustee Linda A. Wall, one of two trustees running unopposed for re-election, sent an email to be read at the forum asking for voter support for her continuing collaborative efforts to bring quality programs to the library. Kealy closed out the afternoon by asking for voters to support his re-election effort. HANSON — Proposed bylaw changes governing recall elections sparked more heated debate during Hanson’s annual Town Meeting on Monday, May 7 — while bulk soil removal and storage as well as marijuana business placement also spurred discussion. “It’s amazing we have 124 people who don’t give a damn about the Celtics,” Moderator Sean Kealy said in announcing that a quorum had been achieved to permit the session to begin. There were 177 total voters signed in for the meeting. After more than two hours of civil discourse on financial and bylaw articles, debate boiled over when the recall amendment came up for discussion. The amendment was passed, 80-50. While Kealy managed to keep his humor for most of the meeting, the recall debate tested his patience as a resident repeatedly ignored his admonition to confine debate to the current issue and not dwell on past recalls. • Violation of law, regulation, bylaw or other abdication of the applicable requirements for the elected position. Former Selectman Bruce Young, who wrote the current bylaw, reiterated his objection to changes, citing the fact that it is similar to the bylaw used in many other towns. He added that it would be difficult to recall an official elected without voter knowledge of a conviction in another state. He “totally agreed” with Kealy’s admonition not to rehash prior recall debate. But resident Mark Vess, wielding a sheaf of recall petitions from a 2014 recall election, raised the temperature of the debate. Selectman Laura FitzGerald-Kemmett made repeated point-of-order objections as Kealy worked to rein in Vess’ comments. “Do not restrict my speech,” Vess said raising his voice. “Hold it right here.” He charged Kealy could not dictate what goes on at Town Meeting, to which Kealy responded was, indeed, his function as moderator. “I know you’ve got the Enterpriseon speed-dial, but I can decide what is within the scope of this argument,” Kealy said. Vess then challenged Kealy to have him ejected from the meeting by police, which Kealy said he preferred not to do. Vess then continued to refer to the 2014 recall. “There are no names mentioned in what I’m presenting here tonight,” Vess said. “It’s a small town,” Kealy responded. Vess continued to read from the 2014 recall petition. Vess said it is not a wise change because recalls are intended to remove officials voters do not feel are doing their job. Holmes Street resident Adam Valachovic noted only half the towns in Massachusetts have recall bylaws. Another resident said it appears to insulate officials a bit, asking what prompted the drafting of the article. McGahan reiterated his position that misuse of a bylaw to control a selectman is wrong, but it included valid reasons to remove an official not doing their job. Voters grudgingly voted to approve a zoning bylaw governing marijuana sales in town, with an eye toward future amendments and/or a referendum and also approved a 3-percent sales tax on marijuana products. Marijuana establishment bylaws were required after state voters opted to legalize recreational use in 2016, but former Selectman David Soper wanted to know how Hanson failed to be among 189 communities restricting it or the 25 communities that otherwise regulate it. Planning Board member Joseph Weeks said because the moratorium was defeated, Hanson no longer has the luxury of time. Young asked what the true consequences of voting down the bylaw. Even the installation of a 40-foot swimming pool would produce 350 yards of material that would have to be moved and stored, Scott said. He also argued it would impact the Highway Department and “anyone trying to run a business” in town while Cranberry growers, of which he is one in Wareham, would be hit hard because of the amount of sand needed in their growing operations. “This is a knee-jerk reaction to something that has to be decided on its merits, not by putting this garbage in the warrant,” Scott said. Another cranberry grower, who lives in East Bridgewater but pays taxes in Hanson, said there are already a lot of difficult regulations governing the business. He doubted the town had standing to supercede state and federal regulations, but pledged to try to work around them if that was the town’s wish. “I’m not so sure we have the right to tell them how to run their business,” Vess agreed. Rosewood Drive resident Danielle Sheehan, said she and her neighbors began the bylaw revision effort because of problems with wind-blown sand in a nearby bog. She has lived on the street for 20 years with no problem until recently, saying they had been working with the town for almost a year trying to deal with it. FitzGerald-Kemmett said the board supports the cranberry business and that the bylaw only requires an annual permit. Bog owners said that, with dropping water tables and uncertainty over which bogs would be threatened, the permit creates a hardship and that agriculture should be exempted. McGahan said he has seen the size of the pile in question and noted the severe windstorms this year have exacerbated the problem. “We didn’t want to do this, but we had to put some kind of control in place so that if it comes down to it, the Board of Selectmen can take action,” he said. The bylaw change was narrowly defeated 73-67. “I knew we were going to have a discussion about plants going in, but I didn’t expect it to be about cranberries,” Kealy said at one point during the evening. Only two budget lines were questioned, one by Planning Board member Don Ellis seeking an additional $5,000 for the town planner’s salary, but that is not permitted via amendment from the floor. The other, regarding Park and Fields expenses was raised by Soper, who questioned the $25,000 budgeted for an expense that he had understood has been covered by user fees in the past. Selectman Kenny Mitchell said the funds were intended to maintain seven fields used by various sports leagues. He said sports groups do not support that effort financially. Fertilizer alone costs $9,000 each year, Mitchell said. Sports groups have provided funding for upkeep of fences, one league representative said, but McGahan, who is active in youth sports, said most user fees go toward uniforms and equipment. Both Hanson and Whitman town meetings were carried live and recorded for rebroadcast by Whitman-Hanson Community Access TV.